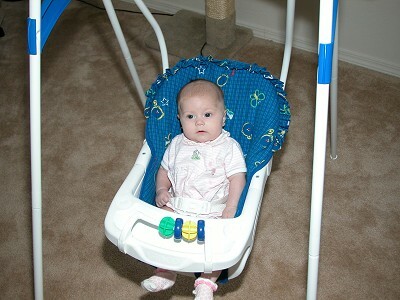 OK, I have new pics of Matt & Lisa's little baby (Alyssa) from a few weeks back. No, I haven't posted them - yes, I'm lazy. Actually, I have just been a wee busy as of late and haven't gotten around to it. Dawn doesn't have gestational diabetes, just so you know (testing was back in late June and I wrote she was going to have it, but never how it went). We are at less than 60 days and there has been alot of "nesting" going on. Here are some pics from when we babysat Alyssa. At one point, Dawn was putting on some boots and she got all happy and started making baby noises so I got the camera and that pretty much stopped. Yes, she loved the swing, and I even tried taking some pictures of her when it was on and moving, but they all came out blurry and out of focus - yes, unfortunately, my camera has some shutter lag. So we stopped it and took this pic and she wasn't really all that happy with us until we started it back up again.